Interesting, I actually prefer the US cover and will probably buy a second copy of the book when I'm in NY in November. 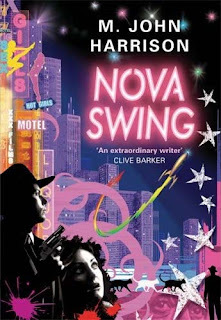 As with most of MJ Harrison's books, pretty much everything is going on under the surface! This sounds pretty good. I'm not big into SiFi but I love noir stuff. The Viriconium collection is especially good. I liked it better than Light, although I did enjoy Light a fair amount. I'm gonna have to check this one out, too! And if there are parallels between this one and Jon's book, I'll have to check his out as well! I'm not sure which cover I prefer -- I normally go for simplistic ones, so that would be the cat, but I'm also quite fond of the UK artwork. Ambiance. Hmm. Good review, especially if this is your first MJH book. I'm a big Harrison fan. He's certainly someone to re-read, take your time over. Marvel at the sentences, the things that go on just underneath the prose, the superb dialogue. He's a stylist, perhaps the genre's best. And most importantly, he pushes the boundaries of the genre. We need people working at this end of things. 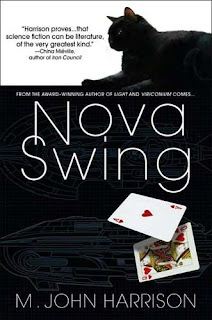 Katie, if you like noir, I think you'll enjoy "Nova Swing" as well as Mr. Grimwood's "End of the World Blues". Yeah, I shall dip my toe a little more in future! Lets just say I'm passionate about MJH's fiction, so it was an incentive... A good place to go is the Viriconium stories. I think it's important to realise just how important they were at the time, and the influences they've had since. He really shook things up back then. Light is great, a mind-blowing journey. Again taking deep physics, but having more fun. Harrison is a wonderful short story writer too. There's a great Gollancz edition THINGS THAT NEVER HAPPEN that has a huge body of his work. I'll stop now, but I could go on!